Pioneer “School” at Singing Creek! Mixed age groups and hands-on learning activities are our specialty. Just like our summer camps for ages 6-10, our homeschool curriculum is designed to work well for boys and girls of varying ages, and has a focus on experiential learning. 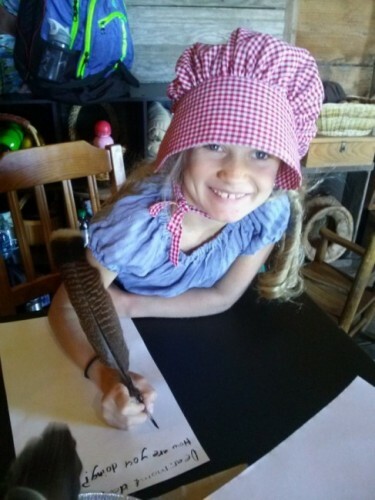 Older kids often help the younger ones, and our relaxed atmosphere in the pioneer homestead allows children of younger ages with limited attention spans to join us or roam as needed. Parents usually stay on site and sometimes even help out with crafts or activities as needed. Our Pioneer School curriculum has been designed for a three hour class either once a month or twice a month, with different focus, activities, and crafts each time. 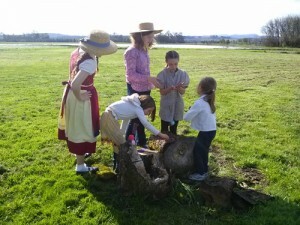 Children learn about the Oregon Trail, homesteading, and nature. 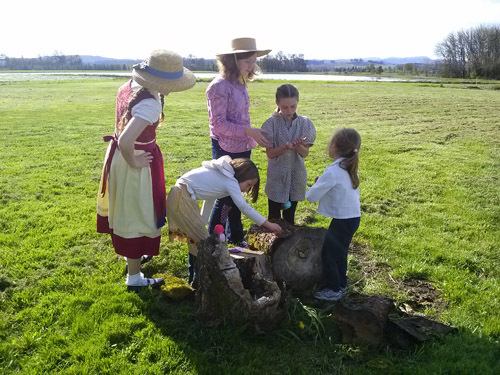 We have a series of classes on the Kalapuya Indians of the Willamette Valley, including learning Kalapuya words, practicing with a bow drill and hand drill, throwing an atlatl, making masks, beads, furs, cedar plank demonstrations, and more. We have a replica table top cedar plank longhouse that we look at, made with hand split pieces of cedar. Storytelling and art are included in this class series. Our facility includes a port-a-potty and handwashing, but we suggest you bring your own drinking water and cell phone. We do not have a landline on the property but our lead instructor always carries a cell phone. You can expect lots of outdoor time, weather permitting, and a fun and engaging hands-on curriculum. Talk to us about scheduling a time to meet and view the property, then we can work with you to find a regular time slot for your group. Cost is $10 per child for up to three hours, with a $100 minimum per class. Parking is close to the granary building which is our Pioneer Homestead. Sometimes we ask parents to provide some supplies like extra firewood for our wood-burning stove in the winter, or snack foods or craft supplies. We have a lot of art supplies already on hand, as well as dishes. Please take a look at our YouTube channel to see videos of kids having fun in our programs, and check out our other pages for more info. 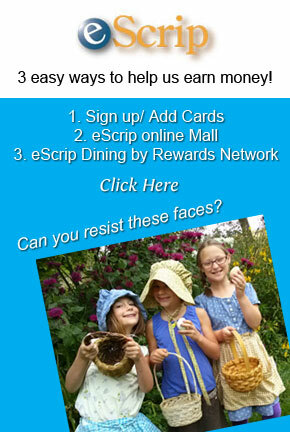 Please LIKE us on Facebook as well! Contact our Director to arrange a tour or for more information.